According to the Ordnance Gazetteer of Scotland 1885 “The Village of Southerness was built some time after the middle of the 19th century by Oswald of Auchencruive near Ayr, in the expectation of its becoming a mining village and depot for coal. The desired mineral having vainly been searched for in the neighbourhood, the village became transmuted into a sea bathing retreat. Southerness point screens the west side of the entrance to the estuary of the Nith and is crowned by a disused lighthouse”. The Nucleus of Southerness lighthouse, built in 1748, is the second oldest surviving lighthouse in the country. A 9.1 metre high beacon built by Dumfries Town Council was heightened and altered in the 1780′s and again in 1842. Lack of finance obliged the Nith Navigation Commission to extinguish the light in the 1867. It was restored in 1894 and raised to almost twice its original height and continued in active use until about 1936. The lighthouse is still in excellent state of preservation and became the emblem of Southerness Golf Club. The Oswald family estates, which Richard Oswald inherited, were founded by his namesake Richard Oswald, the son of the parish minister of Dunnet, Caithness, born in 1705. Having commenced his business career in Glasgow he subsequently moved to London where he became one of the most prominent merchants of his time dealing mainly in tobacco imported from Virginia to this country. He became a prominent diplomat, his career culminating in being the signatory for the British Government to the Treaty of Versailles giving independence to the United States of America. Major Richard Oswald was the son of a cavalry officer serving in India in which country he was born. After receiving his education at Winchester he returned to India serving in Hudsons Horse with the Bengal Lancers. During the second world war he trained troops in Scotland. At the time he had recently married and lived at Drum Farm near loch Kindar (at the foot of Criffel). Major Oswald eventually spent most of his time in London where he found it difficult to maintain adequate contact with Southerness. He sold the property to Southerness Development Company in 1961 and died in 1968. In the 1960′s when it became apparent that there would be the development of a caravan park to the East of the main road to Southerness, Mr David Keswick, a man of great influence in the area, bought the land to the west of the road, (the golf course), in his wife’s name, to protect it from further development. The club subsequently rented the course in a very amicable arrangement. The golf course has since been left to Mrs Keswick’s grand daughter, Miss Catherine Weatherall (now Mrs Soames) after the original owner died in 1969. Mrs Soames is still the honorary president of the club. As originally laid out, the first tee was the present 14th. At 400 yards this was 18 yards short of the present yellow tee but what is now a normally dry hollow short left of the green was a large water hazard. The second (15th) is little changed although generally played from the present white medal tee. The third (16th) was a little longer than now at 450 yards and declared a par 5. The fourth (17th) was played from the present yellow marker but had a deep bunker to the left of the green. The fifth (18th) was measured at 485 yards but a longer carry from the tee was required, particularly down the right hand side where the heather encroached further into the present fairway. The sixth (1st) had a wide cross bunker on the right of the first fairway which is now a grassy hollow. The seventh (2nd) was 410 yards, marginally longer than from the present yellow tee. The fairway was bunkered to the right as well as the present left side bunker. This was a par 5 on the card. The eighth (3rd) was also a par 5 and at 420 yards was 12 yards longer than the white medal tee of today. The ninth (4th) was 175 yards, again some 6 yards longer than from our present white medal tee. The tenth (5th) at 485 yards was something between yellow and white tees but a large cross bunker 50 yards short of the green made it even more difficult to get home in two. The eleventh (6th) was shorter at 350 yards but an early description mentions a long carry to the fairway. The deep depression on the right of the green was originally a massive bunker. The twelfth (7th) was also slightly shorter at 200 yards but there was no fairway, all carry from tee to green. The thirteenth (8th) is little changed from the original which was played from the present white medal tee. The fourteenth (9th) was played from our present yellow tee but the carry to the fairway then was 170 yards. There was a short scrub at the left entrance to the green and a second shot with a slight draw was required. The fifteenth (10th) was played from the white medal tee with the first two bunkers to the front right of the green joined up in one with a long snaky shape. The sixteenth (11th) at 360 yards was somewhat shorter than now but there was a wide cross bunker to contend with. The seventeenth (12th) is little changed from the original although this was 12 yards shorter than from our present yellow tee. The eighteenth (13th) was a par 5 of 450 yards. From old photographs it appears that the heather on the left has grown considerably in the intervening years. Overall there is much more fairway now particularly in the extension of fairways towards tees. Bunkers were originally of irregular shapes often with heather surmounting the tops as well as tufted grass. The problem of sea erosion, particularly near our present twelfth green, was a very serious one. At one time it was feared that the whole green would slip into the sea. A great deal of effort was put into shoring up the banks with sleepers and a retaining wall, much of this by voluntary labour. From a hopeful and enthusiastic beginning the management of the Club became increasingly difficult and the Membership remained at an unsatisfactory level. The Course was very little used and was being maintained at a financial loss. At this time there was a green staff of five. To stimulate interest an exhibition match was played in October 1952 in which the Ryder Cup player John Panton and Dr. W. R. Thomson of Dalbeattie (Club Champion) defeated Jack McLean (former Scottish Amateur Champion and at the time professional at Gleneagles) and Mr. Sam Hastings, Kirkcudbright. Mr. R. G. J. Kirk, Captain of the Club, refereed the match. It was a very wild day with showers and a strong west wind. Panton was the only player to hole-out the Course and returned a 78. McLean in his concluding remarks thought the Course was magnificent “but too long”. After a few years the Clubhouse ceased to be available to golfers and became accommodation for the Paul Jones Hotel staff. Golfers were given the use of 2 rooms at the north end of the hotel. Then the hotel closed, the original Clubhouse was sold and became the new Paul Jones Hotel. With a membership of 122 and no money to speak of this was the situation from which the new Club commenced activities. The building of the Clubhouse and car park in 1974 saw the dawn of a new era. Members now had a new habitat for changing with a short walk to the first tee (the old sixth). From a seat in the comfortable lounge, which for the first time they could call their own, they were able to sit with pint in hand and through the large windows overlooking the 18th green watch players completing their round. There was also a better focal point for visitors to pay green fees and a permanent staff available to collect them with the appointment of Mr. and Mrs. Hudson as resident Clubmaster and Caterer. Their friendly welcome encouraged members and visitors alike to partake of their kind hospitality at the nineteenth hole. There was still a long way to go. There was much room for improvement as scarcity of funds was an ever present problem. The year in which the clubhouse was built saw a steep rise in lady members from 105 to 150 and in country members from 111 to 137 but ordinary members showed a slight decrease to 350. Subscription income for the year to 31 March 1975 was under £5,000 and green fees, at 65p per day, were less. The Reserve Fund showed a balance of £3,600. The total value of course equipment was shown in the books as £700 and the amount spent on seeds and fertilisers for the year was £253. Although the course was able to survive with minimal maintenance the finance was not there to provide for anything else. The summers of 1976 and 1977 were long and dry and while there was a limited water supply for the greens, the fairways suffered badly. The resources were not there to tackle the problem and for a considerable time it was necessary to tee up on the sixth and seventh fairways as their condition was so bad. Estimates for sinking a bore hole and Pumping equipment were obtained but at £3,667 this was beyond the Club’s capabilities. It was not until 1993 that the Club was in a position to succeed in this respect. In this period of time the mechanical skills of Peter Clements were invaluable in keeping the equipment working at all. An automatic pop-up system was installed, however, for greens, approaches and tees in 1979 by Sports Ground Irrigation at a cost of £27,569. This was made possible by a loan of £20,000 on very beneficial terms to the Club by the owners. Mr David Keswick died in 1976 and Captain Weatherall, an enthusiastic supporter of the Club, continued to represent his daughter. The landlords carried on supporting the Club by returning the £5,000 contribution they had made towards the cost of the building as well as providing a further £1,000 for extra storage space. In 1982, when the club had showed a deficit, the rent was reduced for a three year period to carry it through a sticky patch. In 1986 it was found that the Greenkeeper’s shed was inadequate and the landlords provided a large shed at a cost of £18,000. Five years later the greenkeeper again was in need of more space and the landlords erected a second shed costing £29,400 towards which the Club contributed £4,400. without the wholehearted support of the owners through this period it is difficult to see how the Club would have survived. In the five years from 1975 to 1980 membership actually dropped by about 40 and in 1982 the Club was advertising in the local newspapers for new members. A low point of 509 members was reached in 1985 before a steady increase turned the tide. Total subscriptions that year came to £32,000 while green fee revenue provided £20,000. Perhaps the holding of the Scottish Amateur Championship at Southerness in 1985 heralded a turnaround for from that point onwards Club finances improved. The Scottish Ladies held their Championship at Southerness in 1988, the British Ladies in 1989, the British Youths in 1990 and the Scottish Amateur returned in 1995. In 1988 Southemess was first listed in Golf World magazine’s top 50 courses in Britain. By 1990 the membership had risen to 717, an increase of 40% in just five years and for the first time a waiting list was introduced. Subscription income had reached £67,000 including entry fees and visitors green fees £63,000. The rise of basic income was over 150% in that five year period. The burden on Bill Train who also took over the Treasurer’s role in 1985 through these hard years was immense. The success of his efforts by the time he finally retired in 1989, to be succeeded by Major D. Palmer, is manifest in the astonishing growth of the Club in that period. Peter Clement retired as Head Greenkeeper and Hunter Torbett succeeded him in 1985. Hunter’s five year spell as greenkeeper was undistinguished and he was succeeded in 1990 by David Woodbyrne. Another major milestone in the Club’s history was being reached. Several factors which came together at the same time allowed more positive steps to be taken. The accumulated funds of the Club now stood at £75,000, income was strong, a forceful greens convenor in lain Robin was five years into the job and crucially an outstanding professional greenkeeper had been appointed. David Woodbyme was raised in Southern Ireland, received his greenkeeping training at St. Andrews and came to Southerness from Islay where he had been Head Greenkeeper. The Club now had both the resources of finance and manpower to tackle the job of restoring the condition of the course which had necessarily suffered through the lack of resources for many years. A four year plan was produced to tackle the immediate problems. The strategy was to rejuvenate the course as a natural Championship Links, improving the quality and condition of the existing MacKenzie Ross layout rather than introducing new features. David set about this with a will and revetted bunkers started to take the place of old bedraggled ones. The condition of the greens, tees and density of sward have been considerably improved and are at this point in time of a higher standard than they have ever been. New paths have appeared which have taken feet and trolleys away from playing areas and ditches and draining have been transformed. Another of David Woodbyrne’s many attributes is his flair for man management. His leadership and training of staff has welded them nto a knowledgeable and enthusiastic first class team. A severe problem of movement of sand dunes which threatened to ruin the 8th green and fairway was tackled and conquered. Mention must be made here of John Robertson, a former Captain of the Club and prominent member of the greens committee at this time. 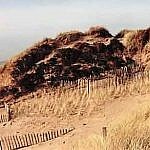 He, together with Scottish Natural Heritage, took a particular interest in the sand dune problem which was combated by erecting chestnut fencing and planting marram grass. This involved several sessions with gangs of Natural Heritage workers complemented by regular work by the Green Staff. Maintenance and rehabilitation work continues to be carried out to stabilise the dunes and prevent the ravages of nature depositing the sand over the 8th hole. 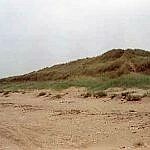 The same Dunes after several years recovery. A bore hole was sunk in 1993 at a cost of £10,000. Inevitably there was still much to be done and a further three year programme of improvements is currently in progress. The 1975/76 drought has been repeated in 1995/96. The work currently being done on the fairways has not yet eradicated all the annual meadow grass and when that dies off during drought conditions bare patches appear. The vast majority of current members were not around twenty years ago when the last extreme weather had an even greater effect on the fairways. Aeration, overseeding with the correct bent and fescue seeds and patience are the important ingredients in fighting the ravages of nature. Ambitions to improve the course were also matched by aspirations to improve Clubhouse facilities. Administration had increased enormously and the cramped accommodation was making life difficult to meet the demands from the larger membership and growing number of visitors. The lounge and dining room were receiving more usage and the kitchen, which served both Clubhouse catering and the Clubmaster’s own domestic requirements was becoming inadequate. Before undertaking costly new projects the Club felt it necessary to obtain the security of a long lease and negotiations to this end were undertaken with the landlords who agreed in principle to an extension of the lease but to make no further capital investment. Despite this, ambitious proposals for a Clubhouse extension costing £175,000 were put to the members and an extraordinary general meeting was held on 25 August 1992 following the results of a questionnaire completed by members. Modified proposals for a £127,000 development were put forward but in a lively meeting these were rejected by 70 votes to 25. Another proposal to sink a bore hole at a cost of £10,000 was approved however and with the help of a grant of £2,000 from the R & A together with an interest free loan of £8,000 this was successfully completed in the following year. The need to alter the kitchen was pressing and at the AGM of 1993 members finally gave authority for this to proceed at a cost of £57,612 together with car park surfacing at £15,000. The club was successful in obtaining a grant of £25,000 from the Local Enterprise Company and most of the remaining funding was raised by allowing 18 members to obtain life membership. This extension was completed in April 1994. During this period of expansion Major Palmer decided to move to Lancaster and in March 1992 he resigned as Secretary/Treasurer to be succeeded by Bill Ramage, a past Captain of the Club. In 1994 the Club learned of a major cash refund, from a change in VAT regulations, of £55,713. The members accepted that this be placed in a Special Reserve Fund until a suitable capital project could be identified. Again a questionnaire was circulated inviting members views. The outcome was for a further extension to the Clubhouse to provide facilities for a starter, shop and competition control room and a storm porch for the main entrance. Sufficient monies were also available for the installation of a partial fairway watering system on the most drought affected holes and the construction of some machine traffic routes. These were all completed by the Jubilee Year of 1997. A recurring theme throughout the history of golf is the raw deal women golfers suffer at many clubs. Their subscriptions are gratefully received but they are not allowed to vote on their club matters. This is not true of Southerness as they have always been offered full voting membership. Throughout the development of the Club, and for the many early years, their membership and continued wholehearted support has helped to ensure the Club’s survival. They have taken a minor role in the recorded affairs of the Club but their encouragement and enthusiasm has been vital in its increasing success. Southerness is always in good order throughout the winter and the ladies are not undone by the men in braving the worst of the elements throughout the winter months.